Cheriton Is a small village and civil parish near the city of Winchester, in Hampshire, England. The settlement is perhaps most famous for being close to the site of the English Civil War Battle of Cheriton 1644. Cheriton is the Source of the River Itchen. The village has two distinct sections: Cheriton and New Cheriton which is beside the A272 half a mile from the main village. Address: Brandy Mount, Cheriton, Hampshire, UK. SO24 0QQ. The Flowerpots Inn lies on the Stagecoach bus (Number 67) route between Winchester and Petersfield. To download a timetable in PDF format, please click here. As old as the hills that surround it. Originally published by Victoria County History, London, 1908. The 3,264 acres of land comprised in the parish of Cheriton are made up of high down country sloping in every direction towards the village, which lies in a river valley almost in the centre of the parish. Cheriton Wood lies away to the north-west of the parish, while stretching west of the wood is the wide plain on which the Battle of Cheriton was fought on 29 March, 1644—the battle which, as Clarendon says, ‘broke all the measures and altered the whole scheme of the king’s counsels.’ The Royalists under Hopton were quartered at New Alresford, whither Waller was advancing from East Meon. Leaving Alresford, Hopton marched south and met Waller on the plain near Lamborough Field. ‘The king’s horse never behaved themselves so ill as that day,’ writes Clarendon, and though the foot ‘behaved gallantly,’ and withstood not only the attack of Waller’s foot but also ‘two or three charges from the horse with notable courage and without being broken,’ yet as evening drew near Hopton was forced to retire to Reading. The village of Cheriton, described by Cobbett in his Rural Rides as ‘a little hard iron village where all seems to be as old as the hills that surround it,’ is at the present day one of the best cared for and most progressive villages in the district. The main road from Winchester to Petersfield runs through to the south of the parish and a lane branching off a few yards past Hockley House leads in a north-easterly direction to the village. As it approaches down-hill, a small unobtrusive house lying back on the south side of the road is known as the Flower Pots Inn. Beyond this are two or three groups of thatched cottages facing south-west, while along the north side of the road runs the high wall of the rectory garden. At the end of this wall at the bottom of the hill the road turns sharply north past the gates of the rectory into the middle of the village. Immediately in the foreground is the village green, through which flows a tributary of the Itchen, running a north-westerly course through the parish, intersecting the village with many branches and crossed by several light bridges. In the centre of the green and on either side are several old thatched and tiled cottages, some half-timbered, for the most part picturesquely grouped behind narrow well-cultivated gardens. North-west of the green a narrow wooden bridge leads over one of the small streams to an open field, across which a well-trodden pathway runs south to the low white gate of the churchyard and to the low square-towered church of St. Michael, which stands here immediately west of the village. The rectory, a fine red-brick house dating from the early years of the eighteenth century, stands close to the church on the south. On the east side of the village is a Congregational chapel, built in 1862, near by which are the Board Schools, built in 1876. Leaving the green and the river and the cottages around it, close by the inn which bears the sign of the Prince of Wales’ Feathers, and calls itself the Hampshire Hunt Inn, the main village street continues in a circuitous north-easterly direction running east of the river, between picturesque low-thatched cottages, the Bricklayers’ Inn, and two or three obtrusive modern villas, to that part of the village which is known as North End, and from here continues north through Tichborne parish to New Alresford. As the road leaves the parish Cheriton Mill, with the Mill Cross, stands away on the river to the east. South of the green and village, the village street curves slightly to the south-east to meet the main road from Winchester to Petersfield on Lane End Down, over which the main road descends to an outlying portion of Cheriton known as Lane End hamlet, which is also approached from Cheriton by a narrow lane through the water meadows. Here the watercress industry is in full progress, since the river with its luxuriously growing watercress beds makes a detour between and behind the several cottages grouped here on its way north-west to Cheriton. Immediately beyond Lane End hamlet the road enters Hinton Ampner parish and so passes on east towards Petersfield. The soil of the whole parish is chalk and clay, with a subsoil of chalk, producing wheat and oats and green crops. Of the total acreage 1,660 acres are given up to arable land, 470 are permanent grass, and 370 woodland. Of the woodland Shorley Copse in the south-east of the parish covers the widest stretch of country, and close to the wood are the Shorley Pottery Works, which afford a special source of employment for some of the villagers. The following place-names occur in 1605: Shoredrane, Holifield, and Charkers; in 1611, ‘Torshawe’; in 1620–24, ‘Somerfield’; in 1648–51, The Breach, Cowdown Close, Eastwood, Brookfurlong, Burrow Land, and Londonway; in 1704– 12, Sheeremead, Kemen Coppice, and Ruffolds. Beau worth, now a civil ecclesiastical parish, was formerly the south-eastern corner of Cheriton parish, and was separated from Cheriton by Order in Council of 4 February, 1879. In 1888 a detached portion of Kilmeston was added to Beauworth, the whole area now being 1,508 acres. It covers a sweep of high country reaching some 530 ft. above the ordnance datum near the Fox and Hounds Inn on Millbarrow Down. From here can be seen fine views of the surrounding district, and it is not surprising that the land is being developed for building purposes. Several new houses have already been built and many plots of ground have been marked out for sale. A narrow road leads down from Millbarrow Down towards the village, which lies in the north of the parish, shut off from Cheriton by thick woodland country. At the entrance to the village is the smithy, beyond which is the white manor-house, now untenanted, standing in fine grounds. The manor farm with its scattered outbuildings, several very picturesque half-timbered cottages grouped round the village green with its tall pine trees, and the modern church of St. James with the village school lying immediately west, make up the rest of the village. Behind the manor-house is a field called the ‘Church Lytton’, the site of a former church or chapel and graveyard. It was here that the great hoard of silver pennies of William the Conqueror, known as the Beaworth Hoard, was discovered. The soil of the parish is chalk and clay with subsoil chalk, producing the ordinary green crops, and wheat and oats on the 443¼ acres of arable land. Dur Wood in the south of the parish is the largest stretch of woodland, of which there are altogether 292½ acres, while 467¼ acres are permanent grass. The following place-names occur: Hillonds and Hooke Close, Hornswood Coppice, St. Cross Mill, Brown Down, Milbarrowe Down, Weely, Nibden Bottom, Rackdowne, the Rakes, the Parke Reade, Homedown, Northall, and Cowleys. From a charter of Ethelred about 984 it is found that amongst the lands given to Winchester Cathedral there were at Easton four hides, at Avington five hides, at Ovington five hides, at Kilmeston five hides, and at ‘Tichebourne’ twenty-five hides. It is noticeable that the lands at Tichborne are of far greater extent than those elsewhere; and it is quite possible that Cheriton, which is not mentioned in the Domesday Survey, was included in these twenty-five hides. Probably a new church was built, within the bounds of Tichborne, and the inclosure in which it stood acquired the name of Cheriton, which has since distinguished the whole district. In 1284 the king surrendered any rights which he had in Cheriton to the bishop of Winchester, who was holding the vill in 1316; and from this time the lordship of the manor remained vested in the bishop. At various dates from 1280 to the middle of the seventeenth century lands in Cheriton were leased to different tenants, the most important being the Inkepennes, who held estates here from 1353 to 1597. Philip le Wayte and his wife Isabel conveyed two messuages and lands in Cheriton to John Inkepenne in 1353, who died possessed of land in Cheriton in 1361, leaving a son John, who at the time of his death in 1374 held nine virgates of land there, his heir being his brother Robert, then aged fortyone, who died in 1405 seised of land in Cheriton, which he left to his wife Margery and his son Richard. The former survived him, and married John Beneyt as her second husband; three years later John Beneyt and Margery gave up their land in Cheriton to Margery’s son, Richard Inkepenne. In 1441 Robert Inkepenne (probably son of this Richard). 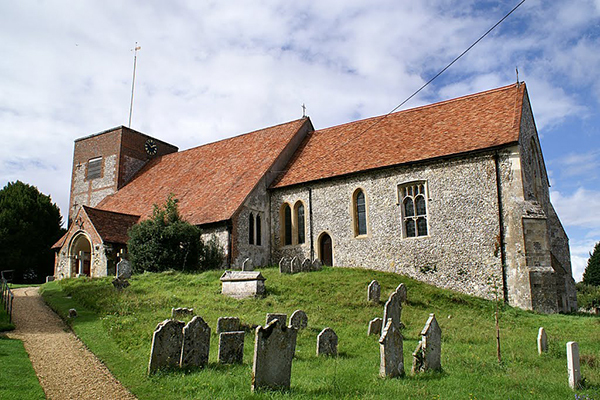 who came of age in 1410, and his wife Elizabeth held land in Cheriton, which was granted to them by Richard Umfray and John Bukke, probably trustee for a settlement, and this Robert, together with John Tichborne, represented the tithing of Cheriton at the bishop’s manor court in 1465. He was followed by his son John Inkepenne, who died in 1514, leaving as his heir his son Richard, then aged three weeks, who was a free suitor at the bishop’s court in 1574. In 1597 Adrian, William, and Francis Inkepenne, Richard’s sons, conveyed their lands in Cheriton, described for the first time as the manor of Cheriton, to Edmund Anderson, Chief Justice of the Bench. In 1651 Robert Reynold was holding the manor on a lease from the bishop, but this is the last record of land in Cheriton being held by under-tenants of the see of Winchester. There was a water-mill at Cheriton first mentioned in 1408, when it was conveyed by fine from John Beneyt and Margery his wife to Richard Inkepenne, and William Inkepenne was in possession in 1518. At a court held at Cheriton in 1606 an order was issued for the water stream ‘from John Hobbsmead’ until the mill to be cleansed every man against his land’ under penalty of 3s. 4d., while an entry at the same court records that ‘Thomas Hart is a common miller and took toll to excess. Fined 8d.’ In 1631 Benjamin Tichborne died possessed of a watermill at Cheriton, but after this date no further record of it can be found. Beauworth (Beworth, Buworth xiv cent.) was originally a tithing in the parish of Cheriton. The earliest mention of it seems to be in the year 1265, when the men of Beauworth paid 26s. 8d. at the bishop’s court. In 1316 Beauworth was held by the bishop. In 1635 it was leased to Richard Bassett, his son Richard, and his daughter Elizabeth for the term of their lives for a yearly rent of £5 19s. 8d. At the sale of the bishops’ lands in 1648 the manor and the site of the manor was sold to Christopher Mercer for £6181; but it was restored to the bishopric at the Restoration, and after this there seems to be no further record concerning Beauworth manor, the manorial rights of which probably lapsed. Mr. Walter Long is the principal landowner in the parish at the present day. John Gater and his wife Sarah sold the site of the manor to Richard Eyre in 1767, in whose family it remained until 1816, when Henry Eyre and Edward Foyle conveyed it to Thomas Westcombe. The church of St. Michael, Cheriton, built on a mound to the west of the village, is in the main a thirteenth-century building. It has a nave and chancel of equal width, 19 ft. 6 in., the chancel being 39 ft. 6 in. long and the nave 47 ft. 3 in., but the former has been lengthened in the fifteenth century. The nave has arcades of three bays, and aisles 8 ft. wide, with a south porch and west tower, all originally of thirteenth-century date, but the tower and aisles have been repaired and partly rebuilt in the eighteenth century and later. The chancel, the added eastern bay of which is built on the east slope of the mound, has a four-light east window with fifteenth-century tracery, and at north-east and south-east two-light transomed windows of the same date, with the difference that in the north window the lights below the transom are cinquefoiled, and in the south they are shouldered and have rebates for wooden frames. The western part of the chancel is lighted by a pair of thirteenth-century lancets on each side, and there is a small priest’s door of the same date to the east of those on the south side. The external masonry of all the thirteenth-century work has been renewed. At the south-east is a trefoiled piscina with a shelf and two brackets, but no drain; it is of thirteenth-century work probably moved eastward to its present position. The chancel has a decided lean to the north from the axis of the nave, probably due to an error in setting out when building round an older chancel. The nave preserves the width of the older and probably aisleless nave to which the former chancel belonged, the arcades of three bays dating from c. 1220 (the date at which, it may be presumed, the aisles were added). They have pointed arches of two chamfered orders, and round columns with moulded capitals and bases with spurs, the latter all modern except part of that of the first column from the east in the north arcade. Both aisles have square-headed two-light east windows of the fifteenth century, but all the others are of modern date with wooden frames. The south porch has a thirteenth-century outer arch with moulded capitals, the inner doorway having a modern wood frame, and the north door of the nave being of like character, but blocked with masonry. On the east jamb of the outer arch of the south aisle is an incised sundial, and on either side of the opening are pieces of elaborately traceried fourteenth-century stonework, built into the walls. The tower has a thirteenth-century eastern arch of two square orders with a string at the springing, but externally shows no mediaeval work, being faced with eighteenth-century brick and flint work. It has a south door of this date. The roofs of the church are modern and red-tiled, that of the nave being carried in one span over nave and aisles. The font, near the south door of the nave, is modern, as are all the internal fittings, including a stone pulpit. There are six bells by Warren recast from the old ring of five, four of which were by John Stares, 1746. The church of St. James, Beauworth, built in 1838, is a rectangular room with lancet windows, a south porch and bell turret on the west gable, containing two bells by Mears, of the date of the church. The fittings are of the same period, with a west gallery, and a small marble bowl on a wooden pedestal, doing duty as a font. The plate of Cheriton church consists of a silver communion cup of 1621, a paten of 1698, and a modern paten. At Beauworth there is a modern set of electro-plate. The first two books of the Cheriton registers, including Beauworth, contain all entries from 1577 to 1740, and 1656 to 1779, respectively. The third book is the marriage register 1754–1812, and the fourth that of baptisms and burials 1742–1822. A book of accounts of the overseers of the poor for Beauworth, beginning in 1732, is kept at Kilmeston. The church of Cheriton, one of the most valuable livings in the diocese of Winchester, has always belonged to the bishops. In 1284 the king gave up to John bishop of Winchester and his successors all his right in the advowson of Cheriton. As early as 1291 Cheriton rectory was taxed at £40, and in 1535 the value had increased, and it was assessed in the Valor at £66 13s. 4d. Such a living was of course one of the prizes of the diocese, and was usually held by men of local if not of wider celebrity; it is not surprising, therefore, that Bishop William of Edendon was rector of Cheriton at one time. The king then granted the rectory and church of Cheriton together with the chapels of Tichborne and Kilmeston to Richard Meredith. From 1644 to 1646 the curious situation is presented of the rectory being held by two incumbents, the appointments having been made by the bishop and Parliament respectively. In 1646 a petition was presented by Heritage Harford asking Parliament ‘to confirm him in the rectory of Cheriton, to which he had been appointed by the Committee for Sequestration in 1644, but which had been granted by the bishop of Winchester, a delinquent, to Hugh Haswell, prebend of Winchester, also a delinquent.’ The latter presented a counter petition stating that he was of an ancient family, that he had been brought up to learning in the university of Oxford, that he was Fellow of All Souls and had been Proctor of the University, that he had been presented to the parsonage of Codford, Wilts. which he enjoyed till the trouble of these times and the reducing of that part of Wilts. under the king’s power, that the living of Cheriton which lay more under the authority of Parliament being vacant he resigned his university appointments and was appointed thereto in 1644 by the bishop, who he conceived had full power to make the appointment, and that he had never been guilty of delinquency. He appealed to Parliament to oust the respondent. A day was appointed for hearing the case, but Parliament being ‘too much occupied’ to consider the matter in question, and there being no further record of the dispute, it may be assumed that it was settled privately in favour of the bishop, who certainly continued to present. Except for this short period the advowson, until the last few years, has always belonged to the bishopric of Winchester. At the present day the living is a rectory with the chapelry of Tichborne annexed in the gift of the crown; the chapels of Kilmeston and Beauworth were also annexed to Cheriton until 1879, when they were separated by an Order in Council dated 4 February, 1879, and they now form a distinct ecclesiastical parish, and the patronage of the joint living belongs to the crown. In 1718 the Rev. Morgan Jones, rector, by a codicil to his will, left £100 to be laid out in land, the annual rent to be for ever paid towards the schooling of the children of the poor of the parish. A piece of land called Northpits in the parish of Chawton was purchased containing about four acres, producing £10 a year or thereabouts. In 1828 Elizabeth Goodrich, by will proved this date, directed her trustees to purchase sufficient stock to produce £20 a year, interest to be applied for the benefit of the poor of the parish. The legacy (after payment of duty) is represented by £600 consols with the official trustees. The kitchen is closed on Mondays.